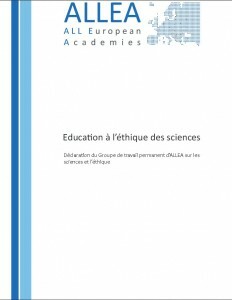 The ALLEA Permanent Working Group on Science and Ethics (PWGSE) is concerned with a wide range of issues, both ‘internal’ (within the scientific community) and ‘external’ (relations between science and society). 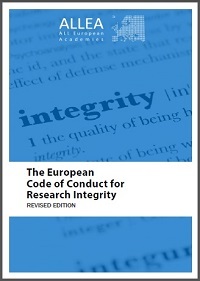 Since ethical considerations have been an essential component in the consolidation of a united Europe, and also in the creation of ALLEA, the PWGSE was established to bring together experts from academies across Europe and provide them with a platform for continuous debate on research ethics and research integrity. 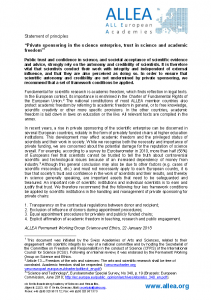 The PWGSE has been extending its capacities and activities during recent years, in order to adequately fulfil its mission of collective deliberation on topics such as research integrity, ethics education in science and research training, ethics of scientific policy advice, trust in science, scientific misconduct, and plagiarism, among others. Further issues recently addressed include dual use, ethical aspects of risks, science and human rights, support for higher education and research in Palestine, research on human embryos, synthetic biology, nanotechnologies etc. 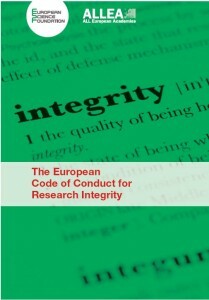 Additionally, the group provides expertise for the Horizon 2020 funded ENERI project (European Network of Research Ethics and Research Integrity), which aims to train experts in ethics related issues and to harmonise research integrity infrastructures across Europe. 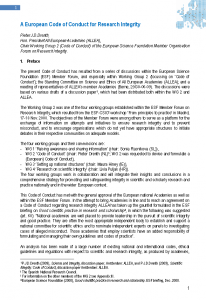 The PWGSE meets regularly and has also convened thematic meetings in wider settings, typically in partnerships with other relevant organisations such as the European Commission, the European Science Foundation (ESF), the International Council for Science (ICSU), or UNESCO, among many others. The members of the PWGSE drew on its extensive network of experts and institutions for the successful execution of the revision process. Emerging issues: synthetic biology, nanotechnology, robotics a.o. The PWGSE organised the workshop “Ethical Aspects of Open Access: A Windy Road” hosted by the Royal Flemish Academy of Belgium for Science and the Arts (KVAB) at the Academy Palace in Brussels on 1 February 2018. Please find the workshop report presentations of the day here. To check the concept and programme of the event, please click here.